We’re in the middle of our takeoff roll when the red “door open” light flashes on the CAP panel. According to the light, the main door on the left side of the aircraft’s fuselage is not properly latched. The captain, my buddy John, who’s doing the flying on this leg, lets out a string of curses at the aircraft. He’s pissed. I look at him, then the panel. The airspeed indicator is closing in on rotate speed as we accelerate. I look up through the cockpit windshield. We have plenty of runway to abort, if we abort right now. A red light is not good. A red light means something potentially serious and life threatening is happening. You don’t—you can’t—ignore a red light. You’re asking to be killed if you do. In this instance, it’s because a fuselage door opening in flight is one of the most irrecoverably dangerous things that can happen. It causes a sudden disruption of airflow, makes the airplane go wildly out of control; nothing you can do will stop it from fatally spinning at high speed into the ground. You will not survive the crash. There may not even be much of a body left to grieve over. More than one colleague of mine has been killed in similar crashes. But John and I know something else—that the switch that’s on the door of these older airplanes is notorious for sending false alarms. You have to close the door just so, or the switch—while it will indicate that the door’s closed as you strap in, taxi out, even start your takeoff roll—will vibrate into a position that will cause it to extend just enough to cause the red light to go on. So we know this red light is probably bogus. We know that we’ll probably be just fine if we continue the roll, take off, and fly on to our destination. And that’s what we’d rather do, because if we abort, we’re going to be late, which is not what we want. The cargo company we work for makes its money flying clients’ time-sensitive documents from place to place on time. Our number one job is to get off the ground, get the work to the destination, and quickly unload—on time. John might be able to explain away the problem due to “maintenance issues,” but it’s all too possible that the Chief Pilot’s office will call him in, wanting to know why he, as the captain, didn’t double check to make sure the door was properly latched. You get enough calls to the Chief Pilot’s office, and you lose your job. That’s why John’s pissed. He’s got a decision to make that he doesn’t want to make. If he aborts, he potentially gets a mark on his record. If he continues, we’ll probably be okay. Probably. Unless he gambles wrong, and this is one of the times where the door actually isn’t properly latched. Then the air pressure differential between the cabin and the outside will build up as we pick up speed as we climb. We’ll hear a loud slamming and the roar of wind as the pressure finally pops the door open, and watch helplessly as the aircraft goes uncontrollable, the ground spinning in the windshield while we scream in terror (I have no illusions that I’d go quietly), filled with horror and regret as centrifugal forces pin us to the sides of the cockpit. And then dark. We’re killed. The airspeed indicator is closing in on rotate speed as we accelerate. We have plenty of runway to abort, if we abort right now. The red light is a false alarm, and we abort. The red light is a false alarm, but we ignore it and continue. Or, the red light is a not false alarm, but we ignore it and continue. The red light is a not false alarm, and we abort. Human-caused catastrophic climate change isn’t real, and we do nothing about it. Human-caused catastrophic climate change isn’t real, but we do something about it anyway. Or, human-caused catastrophic climate change is real, but we do nothing about it. Human-caused catastrophic climate change is real, and we do something about it. There’s intense pressure to ignore and not deal with the problem of human-caused catastrophic climate change. More than jobs will be lost; entire industries will be disrupted. Institutions will have to change. Our consumptive lifestyles will have to change. “Inconvenient” isn’t a strong enough word to describe what we’ll have to go through as we move laboriously from fossil energy to renewable energy. These campaigns have succeeded. You can have all the climate scientists of the world spewing out facts, all the Al Gores of the world spreading these facts around, and that won’t make a difference to those of us who have been convinced by these larger forces that they’re being duped. Many people’s deeply held stories about and disdain for Al Gore and climate scientists will never allow them to accept any facts, however solid, from those sources (more on this in another essay). These questions are factored into the decision matrix that John and I and all pilots face when bad things happen in an airplane. And these are the questions that must take the fore in the “debate” about catastrophic climate change, even in front of the facts, as we argue about whether human-caused catastrophic climate change is real and what to do about it. Human-caused catastrophic climate change isn’t real, so we should do nothing about it. The scientists are wrong (and even conspiring to raise alarm), and we should not disrupt our economies, spending billions upon billions of dollars to retool them, for a false alarm. What are the consequences if this is wrong? If the scientists are right, and their models are right, then we are indeed heading for an apocalypse with monstrous consequences: severe changes in weather patterns that will undermine our global economy at fundamental levels, vast numbers of humans displaced because of these changing weather patterns and rising sea levels inundating an enormous number of cities, and ultimately the potential collapse of human civilizations, perhaps even the extinction of our species along with millions of other species (though I believe that humans wouldn’t go entirely extinct—we are a resourceful and adaptive species). Are those consequences acceptable? It is possible we would leave the generation now alive, at best, with a diminished and disabled Earth, possibly even stranded and starving—which would be morally and ethically unacceptable. Let’s look at the other side. Human-caused catastrophic climate change is real, so we should do something about it. The scientists are right (and ExxonMobile is right—the company freely acknowledges that human-caused climate change is real, and it even supports a carbon tax†) and we will need to spend enormous sums of money to retool our economies. We will need to grow our economies in ways that are in harmony with the laws of nature, the laws of physics. Some industries will have to be displaced, jobs will be lost, institutions will have to undergo wrenching changes—but these are necessary if human civilizations, indeed humanity itself, is to survive, perhaps even to thrive (although we’ll have to respond to the extremely disruptive changes that are already underway due to the rise in the amount of greenhouse gasses). What are the consequences if this is wrong? But what if catastrophic climate change isn’t caused by human activity? What if those of us who accept the science (including ExxonMobile) are indeed wrong? What if John and I in our accelerating aircraft abort the takeoff, and we find out that the red light is wrong? Similarly, what if all the warnings and dire predictions and alarms about human-caused catastrophic climate change are wrong? What are those consequences? We will not be wasting time and money, because money and time spent taking prudent precautions can hardly be considered wasted, just as someone who spent thousands of dollars for a lifetime’s worth of life insurance coverage for her family would not consider that money wasted. 1. less polluting than, say, coal-fired plants, which have their own costs to human health. 2. less centralized and more diverse—just as any investment advisor knows that it’s good to have a diversity of investments, it’s good to have diverse sources of energy (just like it’s good to have a diversity of species; if one fails, others will continue, and the whole system remains healthy). Are those consequences acceptable? The consequences of action are difficult, beyond inconvenient for any of us, but such consequences are much better than risking far greater catastrophe. Though the science is clear in this instance, science is, by nature, seldom able to give final, unequivocal answers, unwavering predictions, a full set of facts. We must ponder more than the facts; we must ponder as deeply, if not more so, these simple questions: What are the consequences if we’re wrong? And are those consequences acceptable? John’s pissed. I look at him, then the panel. The airspeed indicator is closing in on rotate speed as we accelerate. I look up through the cockpit windshield. We have plenty of runway to abort. There was no question. There was never a question. 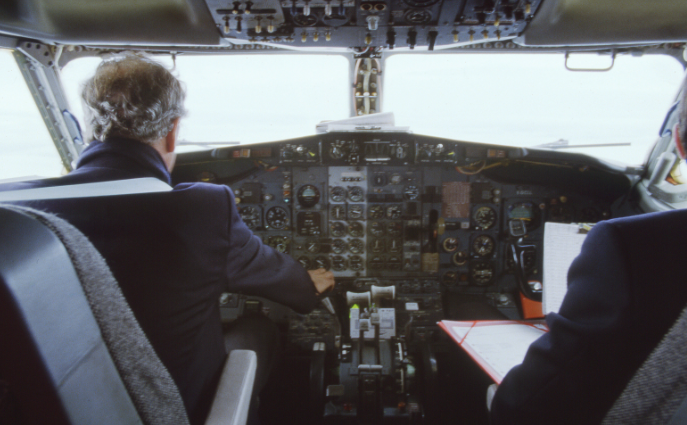 He quickly pulled the throttles closed; I called the tower to tell them we were aborting. We taxied back, shut down, and rechecked the door. Yes, it was latched; there would have been no catastrophe had we continued. But unlike John and I, if we collectively decide to accept the science and act as if human-caused catastrophic climate change is real, we will never know just how true it was, how much could have been attributed to natural climactic cycles. We will only be able to say that the consequences of our being wrong was unacceptable, so we therefore took action. John relatched the door, taking special pains to make sure the alarm switch would not send another false alarm. We taxied out and took off again, this time with the light staying off. We had no sense that we’d made a wrong decision. We’d much rather take our chances with the Chief Pilot and our jobs, than to risk a catastrophe. Neither option was what we wanted, but it was clear which one we’d take. It’s not just the beauty of the Micronesian islands in Steve Goodall’s film that inspires, but his spontaneous, irrepressible motivation to help the indigenous people living there. Steve gave everything he had, selling his beautiful boat Manta, to produce this film and make good on his promise to tell others how the homes and livelihoods of the navigator Rapwi and his people are threatened by sea-level rise. Imagine the change we could make in the world if we all cultivated a phenomenal trust like Steve’s, that after we’ve given all we have, we trust that someone will take the baton from us and carry on. I’d love to hear what you think; please visit the “comments” page of my website and let me know your responses.